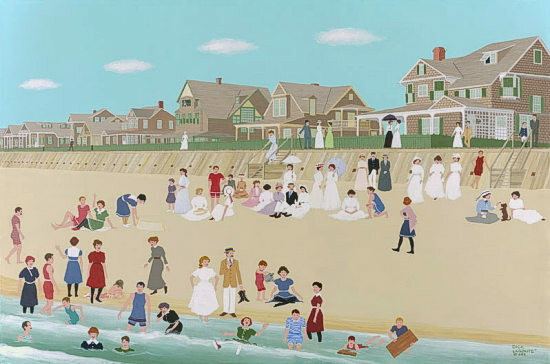 For many years it was customary, in Bay Head, to socialize in your finery on the boardwalk and beach after Sunday church services. This might have been the scene at the Howe St Beach about 1900. The 3rd house from the right is Centennial Cottage. It is thought that it was the Connecticut house in the 1876 Philadelphia Centennial Exposition, and moved to the Jersey Shore. The unusual sea wall constructed here didn't last too long but the house still stands. A small print of this is available in gallery stores only. It is approximately 7 x 10 inches. It is an offset print and sells for $35. Click here for a list of galleries where this print can be purchased.